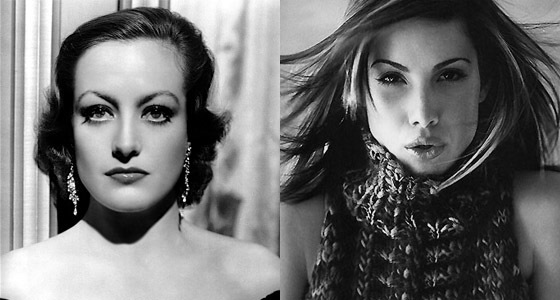 Please Cast Carly Pope in a Joan Crawford Biopic Now | personal.amy-wong.com - A Blog by Amy Wong. Alright, alright – I am hardly not biased… but since going on my Joan Crawford marathon with DVDs and books — yeh, I’ve spent a bunch of $$$ on Crawford stuff this month — I’ve been thinking that Crawford’s life would make one heck of an interesting movie. No, I’m not talking Mommie Dearest. Please, Carly Pope in her Crawford costume? Of course, no squinting of the eyes. Plus, Pope has already sort of played Crawford when they did that spoof on Ryan Murphy’s Popular. She can totally nail it. We gotta admit Crawford pushed women away… especially threatening to her career because she was insecure. With failed marriages, no biological children, her only “baby” was her career which started slipping away with the years. However, she was a survivor… changing to what the public needed her to be, and what she needed to be to survive. A film with the struggles to reach the stars… from flapper to Hollywood diva, her marriages, and lovers~~~ including an on/off affair with Clark Gable, her friendship with him… what would have happened if both their love lives had finally met in the middle? Her miscarriages, her ultimate decision to adopt kids, her tormented relationship with the first two… until the final announcement of the release of Mommie Dearest, and her cutting her first two kids off her will. Hollywood, make it happen. Her life is material for even two films… but considering we know so little of her beginning years, you can cram it into one, right?